Apart from the exquisite Japanese garden at the Shinjuku Gyoen National Gardens, Mrs M’s day was memorable for an encounter with a number of enormous whiskery black carp who were keen on a spot of lunch. The drama continued when she left her iPhone in a taxi which was returned by the driver later in the afternoon. Having taken a number of taxis already while at work, it is probably worth stating that Tokyo’s taxi are exceptionally punctual, clean and efficient. Vehicles devoid of adverts, scratches and dents (unlike Singapore taxis). Rear passenger doors have automatic opening mechanisms to permit safe egress on the kerb side (only). Mrs M was once firmly scolded by a hotel doorman for dismounting on the road side of a taxi. The insides of Tokyo taxis do not smell of Mee Goreng or overpowering lemon air freshener (unlike Singapore taxis). Drivers wear suits and ties and are courteous (unlike Singapore drivers). The satellite navigation systems are equally impressive (unlike….you get my drift). Then again, there is no paranoia about maps in the country either. 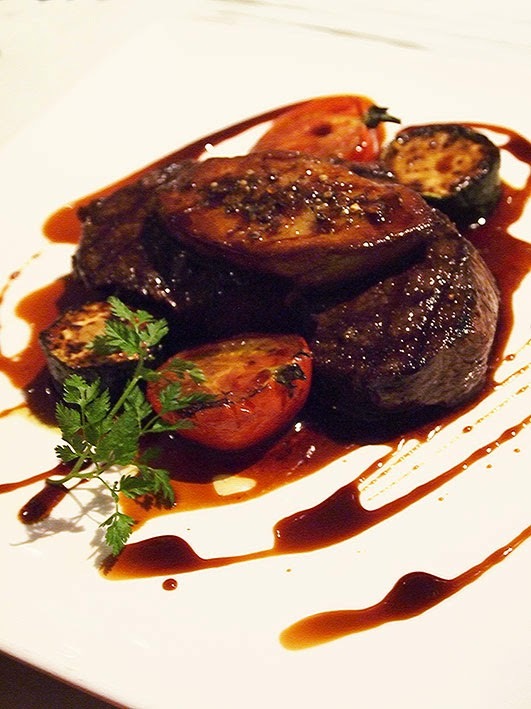 Evening dinner at '29 Twenty Nine' meat restaurant featured Ezo venison with foie gras sauté with a teriyaki-balsamic vinegar sauce.